Fowzi Badavi Nejad, a member of the Democratic Revolutionary Movement for the Liberation of Arabistan who was involved in the 1980 Iranian embassy siege in London, could be released this month after a parole board hearing. Nejad is the only surviving member of the group which besieged the embassy and threatened to kill hostages in an effort to secure independence for Arabistan or Al-Ahwaz from Iran. The other hostage-takers were killed when the SAS stormed the building to release the hostages. 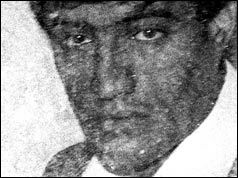 Nejad was sentenced to life imprisonment (25 years) for conspiracy to murder in 1981. Two hostages were killed in the incident, but Nejad was never accused of murder. Some hostages testified that Nejad had prevented further killings towards the end of the siege. Nejad's prison tariff was reduced from 25 to 22 years last year by the Court of Appeal, with the backing of the Lord Chief Justice Lord Woolf. However, he remained in prison under the orders of the then Home Secretary David Blunkett, whose anti-terrorist legislation was recently ruled illegal by the courts. Now aged 48, he is said to be a reformed character and his group has disbanded, which indicates that he is no longer a threat to the UK. Ahmad Dadgar, one of the hostages, has campaigned for his release, claiming that Nejad has been adequately punished for his actions and calling on the British government to give him political asylum. Dadgar, a leading Iranian diplomat at the time, was shot during the siege. His view is shared by Robin Horsfall, one of the SAS officers involved in freeing the hostages, who told the Guardian newspaper in February: "I'd have no problem with him staying in this country. We should say, 'Well, you've paid your debt to society,' and we should let him get on with the rest of his life." A parole board ruling in Nejad's favour will cause problems for the British government as he was a member of a proscribed terrorist organisation. Nejad's release will also have serious implications for British relations with Iran. He cannot be returned to Iran as he will be executed. But allowing Nejad political asylum in the UK could be used by the Iranian regime to reinforce its claim that the British government is harbouring anti-Iran terrorists. Tehran has already accused the UK of sponsoring Ahwazi separatism in Khuzestan. Iran claims that British and Americans are inflaming ethnic tension in the province. Demonstrations in April, which led to the killing of more than 160 unarmed Ahwazis by Iranian security services, were followed by a string of bomb attacks in Ahvaz City on 12 June. Ahwazi groups point out that the unrest is rooted in the Iranian government's campaign of ethnic cleansing and the impoverishment of Ahwazi Arabs, but Tehran is eager to blame the US and UK. The government is alleging foreign involvement in Khuzestan to back up its claim that the UK and US are preparing for an invasion of Iran.